It was with great pleasure that President Jake Ellis presented the American Rhododendron Society Bronze Medal to Ann Chevrier on May 12th, 2015. The ARS Bronze Medal is awarded for outstanding contributions to a Chapter and is the highest commendation awarded by a local Chapter in the Society. Ann has been an active member of the NIRS for over 25 years, serving on the Executive as Ways and Means Director and most recently assisting at our Revenue Table. Ann has been one of the fundraising Garden Tour Coordinators, taken on a lead role in the organization of the Companion Plant area of our Rhodo Show and Sale, spent many hours working at our public Rhododendron Garden, and participates fully in club activities. Ann has opened her beautiful garden to the public for our Garden Tour and hosted our members on many, many occasions. 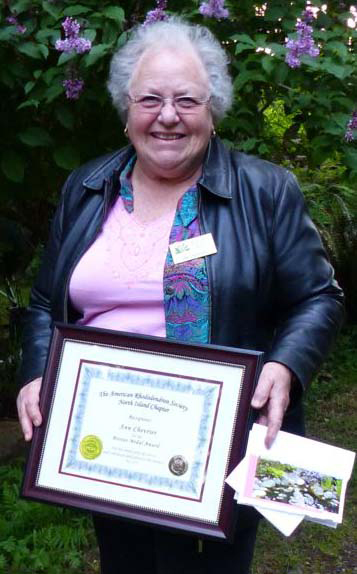 We congratulate Ann on being awarded the ARS Bronze Medal by the North Island Rhododendron Society. The Bronze Medal was presented as part of a framed certificate stating: “The American Rhododendron Society North Island Chapter Recognizes Ann Chevrier for the Bronze Medal Award for her many years of service and continued dedication to the Society. May 2015”.